While Cadillac Mountain and all of the larger mountains get most of the attention from visitors, Acadia National Park has several minor peaks that are worthy of exploration. Just west of the much larger Sargent Mountain and Penobscot Mountain are a trio of smaller peaks--Bald Peak, Parkman Mountain, and Gilmore Peak--that offer arguably better views. The wonderful (and sometimes confusing) Acadia trail system allows you to link these three peaks together into one enjoyable day hike. Carriage-road bridge hunters will also be able to include visiting three classic bridges into a longer loop hike. Access: Parkman Parking Lot or Norumbega "Goat Trail" Parking Lot along Route 3. Elevation Change: 700-ft elevation gain up to Bald Peak, 100-ft gain to Parkman, 300-ft to Gilmore Peak. 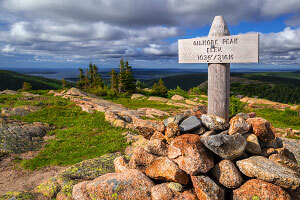 Once on the Bald Peak Trail, follow the cairns and markers up the southwest ridge of the small mountain. Unlike many other peaks in the area, Bald Peak has very few large trees blocking the scenery, so the views of the surrounding area are outstanding, especially Upper Hadlock Pond to the south. Soon enough after roughly 700 feet of elevation gain, the peak relents and you can easily spot the next target, Parkman Mountain, to the north. Continue north along the trail as it descends into a small valley then ascends again to the summit of Parkman Mountain for more great views. The last peak on the list takes a bit more effort to get to. 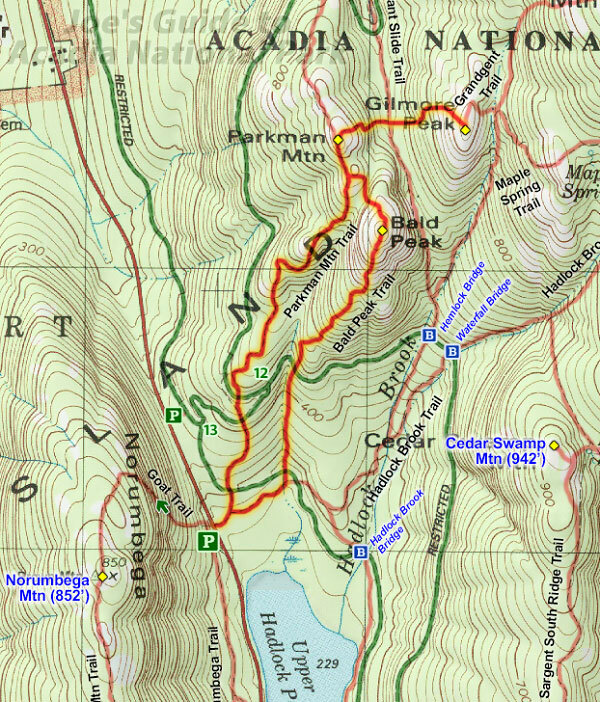 From the Parkman summit, take the Grandgent Trail east to descend into a larger forested valley; take care in this section as the route is steep and clumsy. Once at the bottom of the valley, cross over the junction with the Great Slide Trail and ascend to the top of Gilmore Peak. Gilmore Peak also offers excellent views in all directions, including the imposing Sargent Mountain to the east. 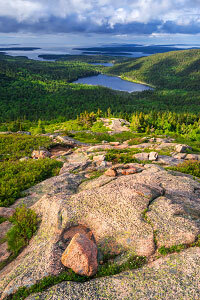 To finish the hike, return to Parkman Mountain and then descend the Parkman Mountain Trail to complete the loop. 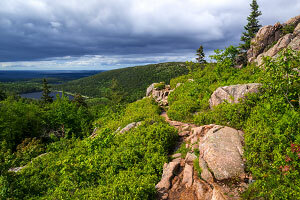 The Parkman Mountain Trail is another scenic stretch of trail that navigates several interesting granite shelves. As the trail reaches the forest line, a lone iron rung helps hikers at an awkwardly steep section. Take the carriage roads back to the Parkman trailhead or the trail all the way back to the Norumbega trailhead. While this specific route makes for an excellent hike, there are many possible variations, including returning on the Great Slide Trail or the Maple Spring Trail, as well as continuing on to Sargent Mountain. For carriage-road bridge hunters, this hike comes very close to three of the classic bridges: Hemlock Bridge, Waterfall Bridge, and Hadlock Brook Bridge. While there may be bigger and taller mountains in the park, this is a wonderful hike to some beautiful little peaks. While the hike isn't too long, it is fairly strenuous with all of the ups and downs and there are a few scrambling sections that may be intimidating to some. Take it carefully at the steep sections.